On December 27, I wrote a post about the latest Business Roundtable’s CEO Economic Outlook Survey and the Duke/CFO Magazine Global Business Outlook Survey. 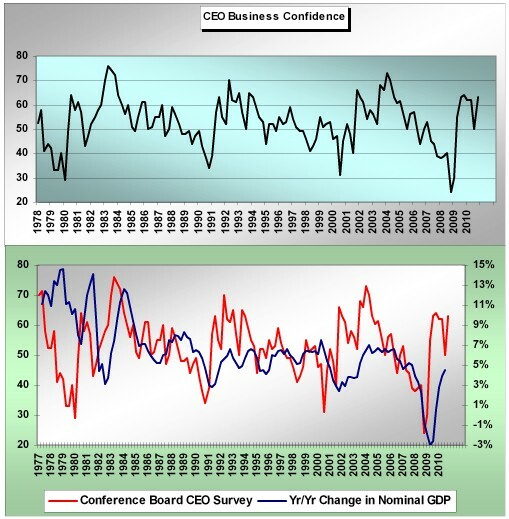 Subsequent to that post, the Conference Board released its 4th Quarter CEO Confidence Survey. The overall measure of CEO Confidence was at 62, up from 50 in the third quarter. 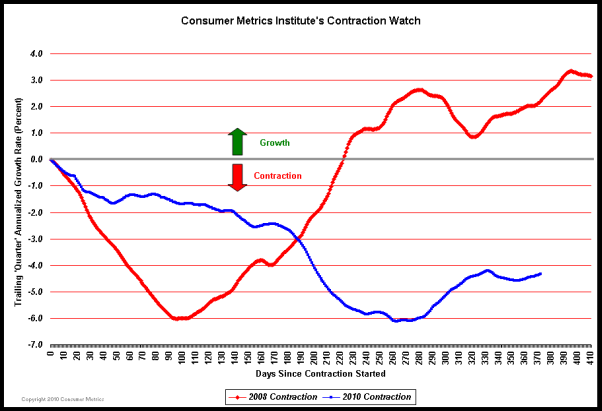 This entry was posted in Business, Economic Forecasts and tagged Business, CFO and CEO Confidence, Economic Forecasts on January 31, 2011 by Ted Kavadas. 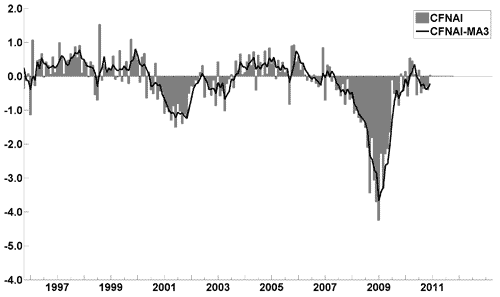 This entry was posted in Investor and tagged US Dollar on January 27, 2011 by Ted Kavadas. I found last night’s State of the Union Address to contain many noteworthy comments. While I could comment extensively on many parts of the speech, for now I will indicate excerpts that I found most relevant, and may comment upon them at a future point. I am highlighting these excerpts for many reasons; it should be noted that I do not necessarily agree with all of them. This entry was posted in Uncategorized and tagged President Obama on January 26, 2011 by Ted Kavadas. The January 17-January 23 Bloomberg BusinessWeek issue had an article titled “Back to the Economic Future.” The article notes “John Maynard Keynes and Fredrich Hayek, who battled over the Depression, are getting a fresh look as the Long Slump lingers on.” It discusses the current state of the (macro)economic profession and theoretical trends within the industry. I think the article is worthwhile, as it highlights several important issues. However, I don’t agree with some of its points. This entry was posted in Depression and tagged The Great Depression on January 24, 2011 by Ted Kavadas. I haven’t posted this material to this blog as those familiar with this blog would likely find it repetitive. This entry was posted in misc. notes and tagged misc. note on January 23, 2011 by Ted Kavadas. The concept of being successful in the global economic environment is a complex one. The January 17-January 23 2011 Bloomberg BusinessWeek had a short interview of Singapore Prime Minister Lee Hsien Loong. Competition is intense, change is continuous, and the fruits of prosperity are unevenly distributed. The only reliable strategy is for countries to upgrade the skills of their people and the capabilities of their economies. This means educating the population, investing in technology and infrastructure to raise productivity, developing new industries to replace declining ones, and constantly adapting to stay relevant. This is what Singapore is striving to do. This entry was posted in Uncategorized and tagged Singapore on January 21, 2011 by Ted Kavadas. The state of Illinois has received much attention lately for its budgetary shortfalls and recently enacted personal and corporate income tax increases. A January 13 Wall Street Journal article titled “Illinois Braces for Tax Increases” provides a summary of the current budgetary situation. I was quite surprised to see state Comptroller Judy Baar Topinka declare on a recent news broadcast that the state’s current amount of unpaid bills is $9 billion, as several well-respected news sources, including the aforementioned Wall Street Journal article, have been quoting a figure of $6 billion. I find this difference, as well as several other facets of the Illinois financial situation, to be disconcerting. I believe that there are a variety of factors that up until now have allowed Illinois to avoid facing the enormity of its situation, given the current budget deficits and substantial long-term liabilities. Perhaps foremost among these factors is that the markets appear to believe that should a state require a “bailout”, such a “bailout” would be exercised by the federal government. Illinois finds itself in a precarious situation; that of increasing taxes during a less-than-strong economy. I’ve previously commented upon various complex facets of this situation in posts of February 23, 2010 (“Tax Increases And Our Economic Situation – Follow Up“) as well as the “America’s Trojan Horse” article. By “sweeping (financial) problems under the rug” instead of truly solving the deficit problems, it almost seems as if states are inherently betting (in a big way) that current economic hardship is transitory, and that better future economic conditions will “save the day.” In effect, there is little need to solve structural budget/financial problems because a strengthening economy will alleviate or eliminate such issues. For many states, this “better future economic situation” has failed to materialize, and now the markets appear to be increasing their scrutiny of the states’ financial conditions. For a variety of reasons, this situation deserves close monitoring. 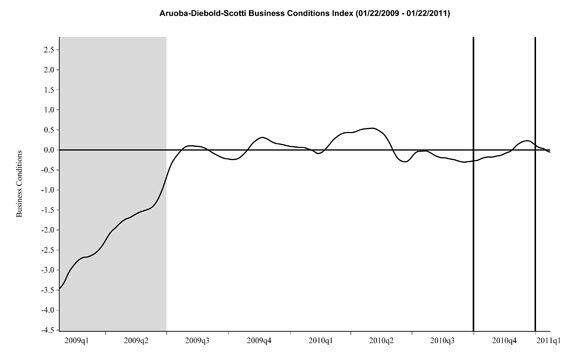 This entry was posted in Uncategorized and tagged state budget deficits on January 19, 2011 by Ted Kavadas.